Golf, a great form of exercise/activity. It’s fun, you get outside and compete in a challenging physical skill. Couldn’t be better, right? Wrong. The problem with golf is, after years of playing and interacting with golfers, I think the negatives just might outweigh the positives. Now, I am ready to concede the benefits of golf. It is an outdoor activity. Major plus. It’s active to a certain degree, particularly if the player walks and carries their bag. Another plus. It is stimulating, fun and allows people to interact with others and challenge themselves. All good things. It gives people a hobby and this can sometimes be another positive. But before we get too giddy on golf and head out to the driving range whistling kumbaya while we work on our long irons, let’s take a look at the flip side of the tee. Problem number one, and this is a big one: The constant swinging of a club is a nightmare on the body. The body is designed to be able to twist, I agree. The body is not meant to twist repeatedly from a bent over position with hunched shoulders and rounded lower back while holding on to a weighted stick. Certainly not hundreds of times a week, or day, for some diehards. Then add in the violence of movement built into a golf swing paired with only side performing the movement. A nightmare for the knees, hips, spine, neck, shoulders, elbows and wrists. Every golfer I know deals with golf related pains. Every. Single. One. The more they golf, the more lob sided and tweaked they get. The only fix for most of them is to stop playing golf. This is such a tremendous negative issue for me that if this was the only argument I had it would be enough to outweigh the positives of golf. Swinging a golf club is NOT good for the body. Problem number two: Obsession. This is a big one as well. The obsession level of golfers is almost unparalleled in the natural world. The amount of time, energy, money and attention golfers spend on or watching their sport/activity/hobby is incredible. Many do it at the expense of other things in their life. To me, this is a recipe for disaster. Anything taken to the extreme is problematic. Whether it is playing, practicing, watching, searching the internet for clubs or tips, taking lessons, dissecting their swing, buying equipment or just talking about it, the problem with golf is that so often golfers take it to the extreme in mind, body, spirit and wallet. Problem number three: Frustration. This is another thing that I constantly see from golfers. So much frustration. Stewing over drives hooked, chips flubbed and putts missed. Frustration with the swing never quite getting there or coming and going at the most inopportune times. There certainly seems to be enough frustration to outweigh the sporadic joys that most golfers get out of a round or just golf in general. I should also note here the frustration and impatience with other golfers I so often see and hear about. 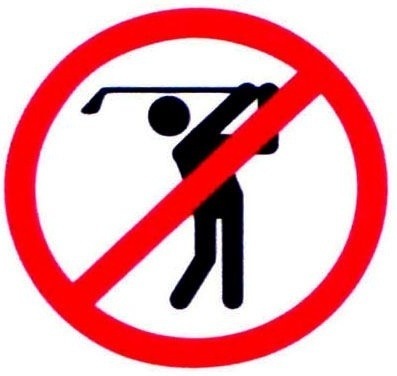 Not everyone falls into this category but there certainly seem to be more than a few stories or experiences of impatient, rude or idiot golfers that disrupt or even ruin the experience. Problem number four. The food. Golfers seem to be attracted to such wonderful health promoting items as sports drinks, sodas, donuts, bagels, muffins, bars, hotdogs, beer, candy, chips, cookies and energy drinks. I see a lot more of those on the course and in the clubhouse than I do waters, nuts and fruit. Then some golfers add in a few cigarettes and cigars for a nice well rounded health promoting 4-5 hours. Problem number five: excessive sun exposure. I am the first person to say get some sun. It is wonderful for your health, mind and body. Being out in the sun for 5 hours is not. Either your skin is being exposed for that long which is not good or sun screen is being used which is really not a good thing. There are a few golfers that cover up with clothing but most do not. Problem number 6: the reliance on technology for improvement. Golf equipment is a multi billion dollar industry. That’s right: billion. Calloway alone sells over 1 billion. Why? Because so many golfers think the solution to their “problem” (because no one’s game is ever good enough) is a new driver, putter, spin controlled balls or the fancy new irons they saw advertised on a commercial during the Masters. I could go on, ladies and gentlemen of the jury, speaking more on the negatives of golf, the persistent disappointments, gambling, massive time and money commitments, unrealistic expectations, junk food, tendonitis and bad backs, embelished stories of success, hours spent hunched over a green, blisters, micromanagement of grip placement, golf magazines and websites, sun burns and weird tan lines but I think it is time to wrap it up. So, in summary, for many people, particularly avid golfers, it would appear the risks of golfing outweigh the benefits. There are some benefits, true, but even those are not worth the frustration, obsession of time, energy and money, excessive sun exposure, food environment, constant new equipment and most importantly the physical tole that comes with swinging a golf club.